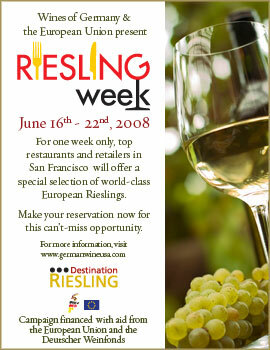 The Riesling’s Are Coming to Town and They’re Gonna Blow Your Mind! One of my fave trade tastings each year is the Rieslings from Germany. Unfortunately, most of these incredible wines never see the light of day in the States. On the rare occasions that I do spy one on the menu and try to order it, I usually get the same comment from my (riesling ignorant) dinner companion, “No thanks, I don’t really care for sweet wines.” For the umpteenth time people, NOT ALL RIESLINGS ARE SWEET AND EVEN THE SWEETER ONES ARE DELICIOUS! I’m happy to report that Rieslings from Germany has decided that it’s time to shatter all your pre-conceived notions and introduce the public to some of the best summer wines available. For one week only, you can experience world-class Rieslings from Germany, as well as Alsace and Austria, at the top restaurants in San Francisco, New York, Chicago and Las Vegas. Restaurants will be featuring European Rieslings either by the glass, by the flight, or creating special pairing menus to showcase the versatility of this varietal. For participating restaurants and retail locations in each city,(many offer complimentary tastings,) go to their website. Thanks to early bud burst and optimal autumn weather, the 2007 vintage in Germany had good yields of excellent quality. German wine grapes had an unusually long growing season, so the year’s harvest was relatively unhurried and took place over several weeks. Grape musts and young wines showed well, with a fabulous wealth of aromas, high ripeness and extract levels, and a well integrated, harmonious — yet marked — acidity. Reislings are my favorite – such a broad spectrum of smells and taste – but always refreshing! I will make one of these events in SF! It seems an interesting oportunity to try rare wines. Welcome Rieslings! will be looking forward to it.